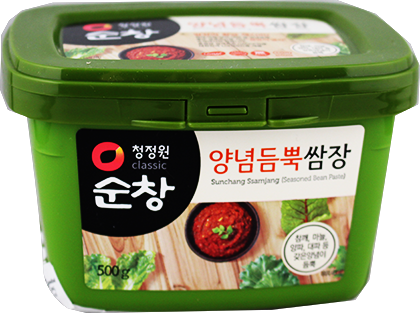 Minimum quantity for "Chung Jung One Korean Seasoned Bean Paste 500g" is 1. Soy bean paste (Soy Bean, Wheat flour, water, salt, soybean, cooking wine, roasted soy bean powder), red pepper paste (corn syrup, rice, red pepper mixed seasoning, soybean), corn syrup, fiber, sugar, water, garlic, red pepper seasoning, cooking wine, roasted sesame seeds, yeast powder, roasted soybean powder, sesame oil, salt, ginger concentrate, oleoresin capsicum. may contains traces of soybean, wheat and sesame seeds product.